Certain black holes may have a complex internal structure, one which could allow planets to orbit the central singularity without catastrophe. This according to a paper recently published by Vyacheslav Dokuchaev at the Institute for Nuclear Research of the Russian Academy of Sciences in Moscow. Abstract: Inside the rotating or charged black holes there are bound periodic planetary orbits, which not coming out nor terminated at the central singularity. The stable periodic orbits inside black holes exist even for photons. 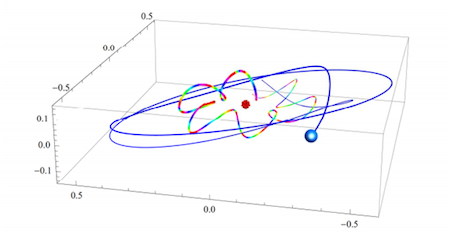 We call these bound orbits by the orbits of the third kind, following to Chandrasekhar classification for particle orbits in the black hole gravitational field. It is shown that an existence domain for the third kind orbits is a rather spacious, and so there is a place for life inside the supermassive black holes in the galactic nuclei. The advanced civilizations of the third kind (according to Kardashev classification) may inhabit the interiors of supermassive black holes, being invisible from the outside and basking as in the light of the central singularity and the orbital photons. SF fans recall that the Heechee retreated to the interior of a black hole in Frederik Pohl's 1984 novel Heechee Rendezvous, sending out occasional scout ships to see if the coast was clear. See Is there life inside black holes? ; thanks to Winchell Chung for the tip on this story.